Throughout human history, fanatical rushes for fortune have resulted in sharp changes in civilization. The conquistador gold rush of the 1500s opened up exploitation of the Americas by Spanish colonial powers. The California Gold Rush of 1849 drove rapid development and industrialization, propelling San Francisco to the international stage. The Texas oil boom of the 1900s helped kickstart the American petroleum habit and its destructive consequences on global climate. And looming large in recent memory, the tech boom of the 90s, which not only brought us eToys and Pets.com, but also helped elevate familiar names like Amazon and Ebay to the limelight. There is no doubt that we are in the midst of another rush: cryptocurrency. Decades from now, we wonder if people will speak of the Great Crypto Boom of the 2010s, and of the myriad curious DApp (decentralized app) concepts that occupied the scene. While many DApps will prove to be ephemeral (and little more than frenzied attempts to cash in on the current crypto rush), we at Qchain aspire to build a product that will offer true benefits of fairness, convenience, and privacy to its client base and emerge from this boom as a genuinely useful product. Many people ask us what differentiates us from competitors like BAT and adChain, and whether the advertising space is overcrowded. All three of our projects have significantly proposed back-end and monetization structures. As a result, we believe there is room for all of us to co-exist in the space to meet the demands of different users. And Why Are We Developing For Two Blockchains? We are convinced that Ethereum and NEM are the two most promising blockchain technologies for enterprise in development right now, both for their tech visions and robust developer communities. They have different strengths and focuses: Decentralized smart contracts are currently a bit easier to develop on Ethereum, while NEM offers the Proof-of-importance (POI) algorithm and the Eigentrust++ reputation system to encourage transactions. We believe that giving our users choice and flexibility can only benefit them, as they can opt for the blockchain that best suits their needs. It’s important for us to note that working on two blockchains is not something we have haphazardly thought up as a cash grab that will split our efforts and attention. Dual chain support was integrated into our planning from the very beginning, as we are driven to create a responsive and encompassing product. Additionally, we are prioritizing development on both blockchains with equal weight. We are doing this by building development teams dedicated to each blockchain, rather than having developers flit between both. Following our crowdsale, we will further solidify and expand the size of the teams in step with each other. With several months of development behind us, and a roadmap we intend to follow strictly, we are currently working at full speed to bring a functional alpha for public preview. We start by presenting a sneak peek of our front end. The front end will consist of four main sections: the advertiser section, the publisher section, the host section, and the marketplace. A user will be able to serve as both advertiser and publisher. The user will be able to select the section from a drop-down menu. 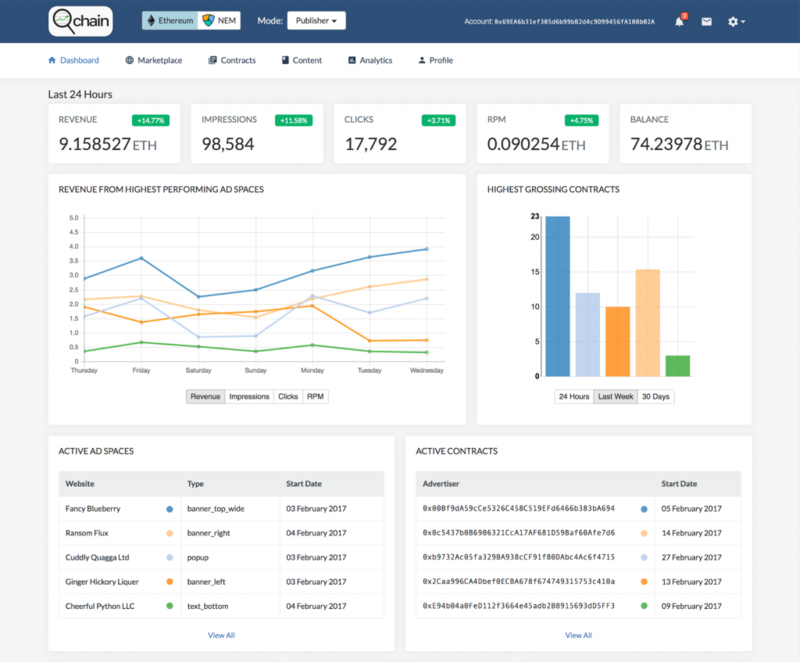 The user will also be able to toggle between NEM and Ethereum sections with a simple button click. Above is a screenshot from our internal alpha of our publisher screen to give our audience an idea of what to expect. Users can see panes for analytics corresponding to advertising revenue and earning performance. Also available are summary statistics of total clicks, total revenue, and balance. Additionally, users can see a list of active contracts, and of ad spaces. The interface is highly informative, while still maintaining an aesthetically clean and easy-to-read functionality. It’s paramount for us to make Qchain easy to use. We are developing our product with the average consumer in mind; our goal is not to merely create a token that people can manipulate and pump, but rather to create a sustainable product that will enrich the digital advertising industry. We hope you like what you see — and do not hesitate to give us feedback! Look out for our alpha to come in the next few weeks.